After going years without update, Apple has decided to discontinue the Thunderbolt Display, marking an end to the company's current first-party monitor product line and sparking speculation that a high-resolution replacement is in the offing. The surprise end-of-life announcement came by way of a quiet confirmation to The Verge on Thursday. 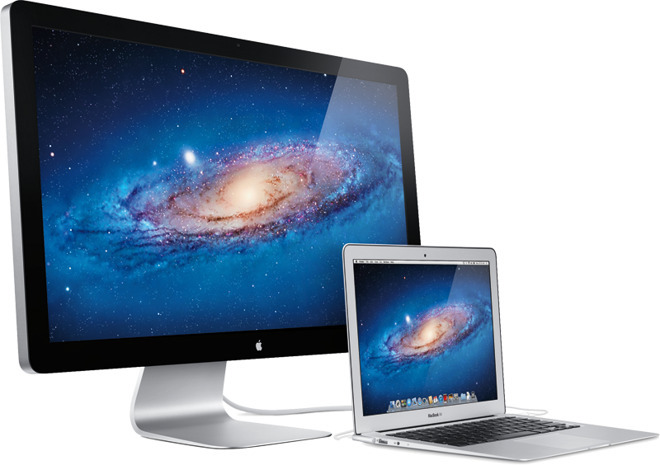 "We're discontinuing the Apple Thunderbolt Display," an Apple spokesperson said. "It will be available through Apple.com, Apple's retail stores and Apple Authorized Resellers while supplies last. There are a number of great third-party options available for Mac users." No mention was made of a replacement to the $999 piece of kit, though it has long been speculated that Apple is working on a 4K or 5K upgrade. The most recent rumblings suggested the company was preparing a Thunderbolt Display with 5K Retina display that included its own graphics card, though a subsequent report poured cold water on those claims. Incorporating a GPU capable of driving ultra high-resolutions would theoretically ensure compatibility with almost any modern Mac. Not a main product category for Apple, the Thunderbolt Display has gone untouched since 2011. Fans of the monitor's design and ease of use have not so patiently awaited a hardware refresh, but the product seems to be a low-priority concern. Hope were most recently rekindled in March when the display saw shipping times slip in Europe. Whether Apple plans to launch a Thunderbolt Display successor or simply leave the monitor business altogether remains unknown. For now, however, it appears the company is putting in-house display efforts toward the all-in-one iMac lineup, which currently comes in 4K and 5K Retina display flavors. With Apple's Thunderbolt Display officially in retirement, those in the market for an external monitor can check out AppleInsider's roundup of the best alternatives.